Hello darlings! Since arriving back home from Thailand, I’ve had mountains of photos to sort through and slowly but surely I’ve been editing them to share with you all. 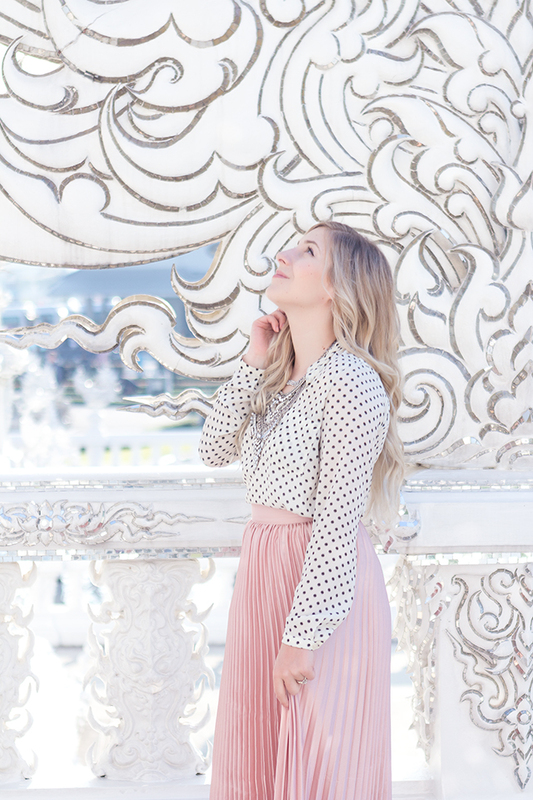 Today’s post is from one of the most beautiful places we visited in Thailand: Wat Rong Khun, the incredible white temple in Chiang Rai. Make sure to click through to read the full post, because it is packed with gorgeous images, tips on visiting this magnificent monument and a hilarious story about what it’s really like trying to take photos as a fashion & travel blogger. One of the main reasons I decided to travel to Chiang Rai is I wanted to see Wat Rong Khun, the beautiful white temple in person. Sparkling and white, the architecture looked incredible in photos and it was an absolute must see for me. The temple definitely did not disappoint! The structure is stunning and the grounds are incredibly beautiful and well manicured. I can only imagine the years of work that were put into designing and building this incredible work of art. On the day of our visit, we arrived bright and early to beat the crowds and capture the temple in the morning light. Tourism Thailand (which I had fully expected to be a reputable online source!) says the temple opens at 6:30am and since we were on a mission to take photos without any other tourists in the frame we planned to arrive just before the temple opened its doors. The only problem was once we arrived, we realized the online opening times were incorrect and the temple didn’t actually open until 8am! As more and more tourists poured into the area surrounding the temple we realized our dream of taking photos without crowds of people in them was slowly slipping away. However, since we were so early we parked ourselves in front of the gate so we could at least try to be the first person on the temple grounds in hopes of getting the perfect shot in front of the temple. Since there is a clear view to the temple from outside the gates, my husband and I came up with a plan to have him wait with the camera ready to get the shot from outside the gates, while I queued in line to make sure I was the first person on the property as soon as the temple opened. While waiting to be let in, I chatted with other tourists and local Thai’s visiting the temple. One group of Thai women asked to take a few photos with me (I can only assume I’m the whitest person they have ever seen!) and we chatted about how I was taking photos for my blog. However as soon as the gate opened all niceties were forgotten. The group of Thai women who had asked to take photos with me suddenly became my rivals as I walked as quickly as possible (in towering stilettos no less) to get to the front of the temple. However, as soon as I started walking towards the temple entrance, they literally began running behind me carrying full-on tripods in what I can only assume was an attempt to get the same shot I was trying to get. It must have been a sight to behold for sure. My husband did his best to get the shot, but he was no match for the determined group of women following behind me. While we didn’t get the perfect photo in front of the temple, we were instead gifted with a memorable story we won’t soon forget. After visiting the white temple, we definitely learned a few things that would be helpful to anyone planning to traveling to Wat Rong Khun. So here are a few of my personal tips! As you likely read in the above anecdote, the White Temple opens at 8am… not 6:30am as the Thai tourist board claims. It is certainly worth visiting the temple as soon as it opens since the crowds are thinner, but the lighting for photographing the building itself is less than idea. Since the front of the temple faces east, the sunrise casts a very harsh yellow glow over the entire structure. Unfortunately, we found that all of our photos taken prior to the temple opening were unusable due to the poor lighting. My suggestion would be to go early in the morning to enjoy the temple, but then go back near sunset to photograph the building from the front. Although we weren’t able to travel back to the temple in the evening ourselves, I can only image that the sun setting behind the temple would make for some magical backlit images. We traveled to the White Temple by taxi, and when asked if we wanted our driver to wait for us to return we told him we would be fine. I didn’t want to feel rushed by a running taxi meter and since the White Temple is easily the biggest attraction in Chiang Rai, I assumed tourists would be coming and going all day long. However, it turned out to be much more difficult to grab a taxi for the ride home than we had expected. Most of the tourists at the temple were part of scheduled bus tours, and the few that had gone on their own had either hired a driver for the day or driven themselves. After we were finished visiting the temple, I tried calling for a taxi and using the local taxi app, but no one would come. They were all either busy or not interested in our fare since Wat Rong Khun is outside the city limits. We ended waiting for nearly an hour, walking up and down the street searching for anyone we could pay to drive us back into the city. My feet were completely blistered from the my stilettos (I know, I know… probably not the best shoes for traveling!) by the time we finally saw a songethew dropping someone off at the temple. I have never in my life been happier to jump in the back of a pickup truck! Knowing that I was visiting a temple, I planned to dress very conservatively. 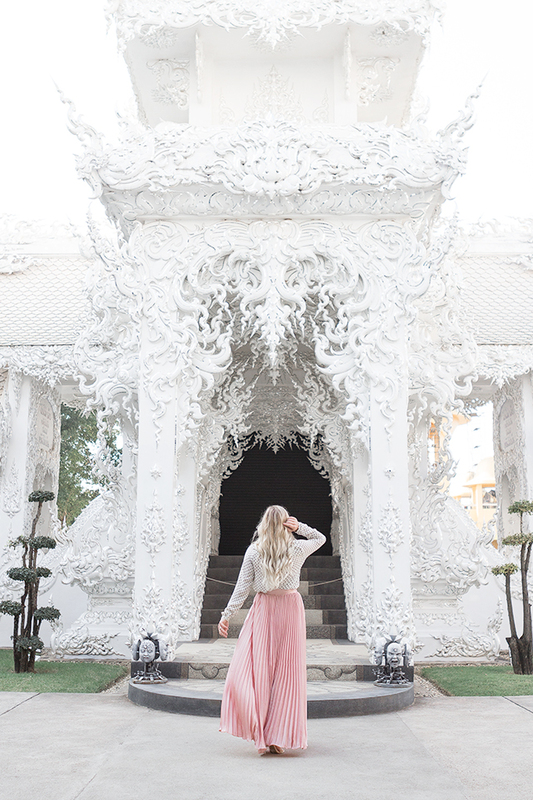 Typically Thai temples will require that womens knees and shoulders are covered so I figured a long sleeve blouse and a maxi skirt would be more than acceptable. However, I still ended up getting into trouble with the temple guards. In a hilarious moment caught on video, I did a little twirl to show off my skirt in a photo and was subsequently yelled at and told to stop by one of the temple guards. So, while choosing modesty in your outfit is important, make sure to also consider propriety in your behaviour and be aware that dancing, twirling and otherwise posing for photo could possibly be considered disrespectful around such a religious monument. 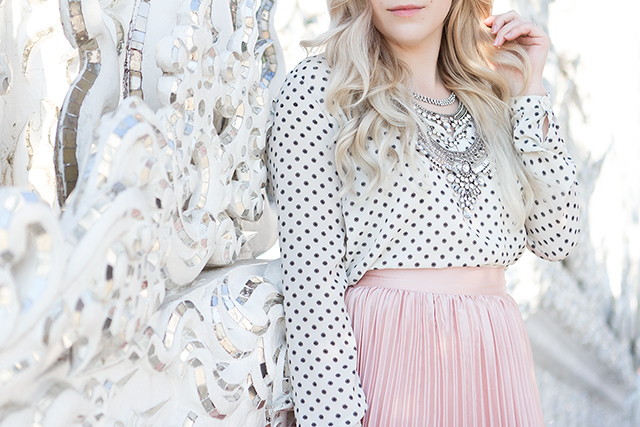 I hope you all loved todays post! Let me know if you like reading more in-depth travel posts by leaving a comment. Also, if you liked today’s outfit make sure to click the links below to find more details on purchasing these gorgeous pieces for yourself. Blush pleated skirt: c/o Romwe. Luxe silver necklace: Shop Pretty Little Details. Haha, yes the guards at the temple are very serious about their jobs! 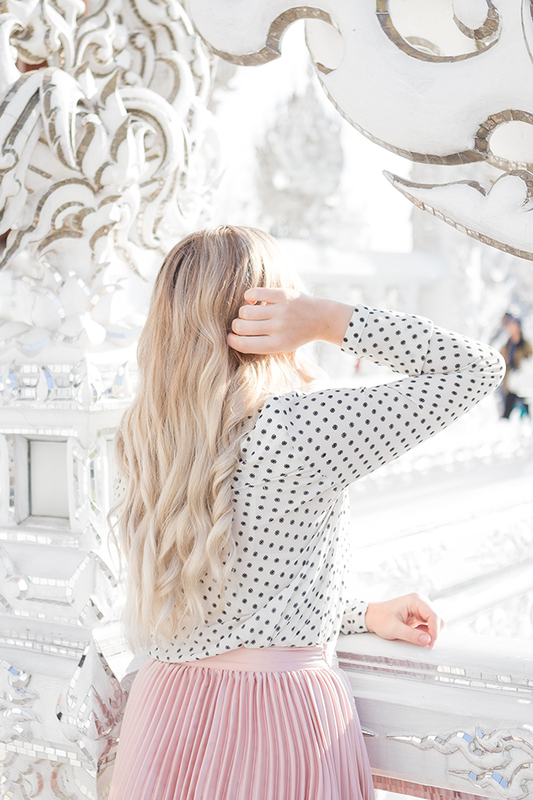 We were definitely sweating through our clothes at the temples we visited in Bangkok & Bali but Chiang Rai was actually quite chilly… I almost had to wear a jacket over my outfit the day we visited the White Temple. OmGGG Girl! This scenery is sooooo beautiful!